Here they are! Clear, text-only descriptions of each basic Land & Water 1 term. 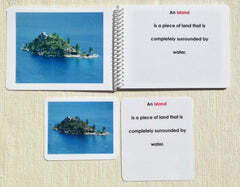 These definition cards match the pages in the Land & Water 1 book, but in this card format, the children get to mix and match. They can play with phrases as if they were puzzle pieces, all while rebuilding the definitions accurately. This is hands-on learning at its best. Also available in Spanish and Chinese (developed with the AMI Training Center of China).Laminated cards are ready for use. Unlaminated cards are being discontinued so what we have in stock is hugely discounted! See laminating recommendations if purchasing unlaminated cards. Created by a Montessori teacher. Eco-printed by parents/teachers/students in our rural New England office. Cloth pouches sold separately.